A fresh and fanciful steampunk version of the classic Robert Louis Stevenson novel. Colorful and upbeat episodes at a lively masquerade ball. A thrilling and dynamic interpretation of Carl Orff's "scenic cantada". Reveille Men's Chorus presents ON HOLIDAY! Subject: Reveille's upcoming shows on the MOVE! Reveille Men's Chorus invites you and your family to celebrate the holidays with us and our annual fun and gleeful evening of holiday music. It's glorious; it's campy; it's high energy; it's "The Most Wonderful Time of the Year" at the Leo Rich Theater, December 4th, 5th, and 6th. Reveille will take you "On Holiday" for a tour of seasonal gatherings abroad and at home, featuring jolly carols and nostalgic favorites with a healthy serving of humor and whimsy from the traditional "While Shepherds Watched their Flocks" to the wacky "Chanukah in Santa Monica" and "Forgotten Carols from Other Lands." Artistic Director Shawn Cullen and over 60 Reveille voices celebrate with surprises, fun, nostalgia and good ol' fashioned carols. See you December 4th, 5th, and 6th at the Leo Rich Theater, 260 Church Street in Downtown Tucson. Tickets are available at reveillemenschorus.org and Ticketmaster (very soon!). Tickets will go fast, so get yours now! THE WHISTLE STOP DEPOT DOWNTOWN TUCSON! Unbreakable, by Sam Watson and Christina Ernst, was selected to open the very first concert ever performed in Stevie Eller Dance Theatre. The piece, using 8 dancers to explore the intricacies of glass, is presented again to commemorate the decade of UA Dance performances on the Stevie Eller stage. Other pieces coming back include Michael Williams HER/HIM and, to the music of the brilliant composer, Astor Piazzolla, Amy Ernst’s clever Twisted Tango. Also capturing the power of major composers will be a new ballet by James Clouser called Five Studies in Locomotion. Showcasing music from Mozart to Moon Dog, including Shostakovich, Hough and Glazunov, this piece will keep you at the edge of your seat. Not seen since first performed on Mainland China in 1988 will be a moving work called You Again, by Douglas Nielsen. This duet was originally created for identical twin dancers in the Guangdong Dance Company. To music by Chopin, and with a fresh look at partnering, this work will be re-staged for our UA Dance audience. Anchoring the program is Ben Stevenson’s masterwork, Four Last Songs. Set to Richard Strauss’s poignant, haunting songs of farewell, this work was hailed by The New York Times as “exquisite.” Four Last Songs has been performed by prestigious dance companies across the world including San Francisco Ballet, Chile’s Ballet de Santiago, and London’s English National Ballet. TUCSON, AZ – October 26, 2015 – Tucson, Arizona’s own Science Fiction, Fantasy and Horror Convention, known as “TusCon,” announces an additional star-studded panel entitled “Bonus Features: Tales from the Set of TV and Film Productions.” The panel is set for Sunday, November 1 from 2-3 pm. The panel discussion features Emmy Award winning “Action Scientist” and star of TV’s Meteorite Men and STEM Journals Geoffrey Notkin; TV legend Don Collier (The High Chaparral and over 200 other credits); multiple award winning producer/director Don Dehm (The Bob and Angus Show, Silver and Brass, etc. ); film and TV actor Rogelio Camarillo (Legends and Lies: The Real West, Fonterra Rojas, etc. ); and critically acclaimed film and TV actor/director Eric Schumacher (Zhon: The Alien Interviews, Legends and Lies: The Real West, etc.). The panel discussion takes place on the third day of the action packed 42nd annual TusCon Science Fiction, Fantasy and Horror convention. TusCon 42 also includes appearances from New York Times bestselling/multiple-award winning sci-fi/fantasy author Seanan McGuire, artist Bridget E. Wilde, and popular cosplayers Autumn Ivy and Courtney Leigh. The event also features Tucson’s own “nerdcore” music group Will There Be Cake?, late night sci-fi burlesque produced by Gypsy Danger, and over 70 other panelists and speaking events all day and all night on many topics of interest to pop culture fans. TusCon 42 also offers the always popular TusCon Masquerade Contest, special film screenings with guest filmmakers in TusCon’s Video Room, the Anime Screening Room with special anime programming, TusCon’s “TusLan” computer gaming center, the vendor room, art show, a mass autograph signing at no additional charge, and much, much more. “We’re proud to add this stellar panel to our already amazing slate of events this year,” say Scott Glener and Joe Palmer, TusCon’s programming team. Convention: Friday October 30, Saturday October 31 (Halloween), and Sunday November 1, 2015. Memberships sold online and at the door (based on availability). Families and small groups welcomed. Ever since the days of silent movies, Tucson has been a key location for Hollywood filmmakers. The western was the most popular genre, naturally, with Old Tucson serving as the shooting site for dozens of classic films, starring legends including John Wayne, Paul Newman and Kirk Douglas. But non-westerns were also filmed in Tucson, with filmmakers taking advantage of the beautiful desert environment and the unique architecture of the city itself. Enjoy a brief presentation by a School of Theatre, Film & Television faculty member just before the screening, as well as a student film short and Q&A opportunity with one of the actors from SLASHED! Based on the award-winning first novel from Rosemary's Baby author Ira Levin, A Kiss Before Dying is a suspenseful thriller about a charming sociopath, played by Robert Wagner, who seduces the heir of a mining dynasty (Joanne Woodward) in an attempt to get his hands on her inheritance. This Hitchcockian film is particularly exciting for Tucson residents, as it was shot all over town, including downtown and campus locations! Old Pueblo Playwrights’ 12th Annual Play-In-A-Day Festival will rock midtown Tucson on November 20th and 21st at Unscrewed Theater, 3244 E. Speedway. 6 Directors tasked with rehearsing the plays through the day with Actors cast just that morning for public performance that very evening! Equals 24 hours of Dramatic Fun and Laughs!! Do YOU have what it takes to Write, Direct, or Act a play all in one day? Contact Festival Chair Dave Sewell at dndsewell@cox.net today! Want to know more about OPP? Check out our New Play Festival going on this weekend (Friday 10/31 & Saturday, 10/31; November 1st, 2:00) at the Cabaret Theater at the Temple of Music and Art, 330 S. Scott, Downtown Tucson. Tickets are only $7 at the door (cash/checks only, please). Subject: Funny on Fourth: Get Spooky! Get Your BOOty to TIM for Halloween Fun! GHOST BUSINESS is TIM's newest scariest longform improv team. Taking inspiration from a scary story, Ghost Business will definitely make you laugh...and fear for your life! Come catch their last show before the disappear into the night! The Ghost Business cast features: Abbie McCracken, Emmet Andrews, Cameron Hendrix, Leland Long, John Roth, and Luke Connell. Then the TIM Halloween tradition continues with The Bat! An Improv set performed completely in the dark by our most experienced improvisers. Don't miss this event! The Bat Cast features: Emmet Andrews, Catherine Bartlett, Brooke Hartnett, Andrew Hatch, Cory Jenks, Dan Kellish, Daniel Kirby, Justin Lukasewicz, Jessica Peck and Clare Shelley! Friday at 7 PM our Comedy School Student take the stage in Improv 101/401 Student Showcase. After 6 weeks of training in the comedy arts, our students put their skills to the test in front of a live audience. Come support your friends and family! At 9 PM The Soap Box welcomes our neighbors from 4th Ave, when staff from the Food Conspiracy Co-Op join us as monologists. The Soap Box features the most aggressive cast of improvisers in Southern Arizona: Catherine Bartlett, Andrew Hatch, Cory Jenks, Daniel Kirby, Justin Lukasewicz, Jessica Peck and Clare Shelley! Saturday at 7 PM, Improv Throwdown takes the stage! Our fast paced short form show features, improv games, rap battles, and improvised jokes made up right on the spot. Which team will walk away with the street cred this week?!?! Saturday at 9 PM, Ghost Business and The Bat close out the spookiest month of shows at the TIM Comedy Theater! We are so excited to welcome new students to try out improv comedy. Join the premier comedy school in Southern Arizona, and learn the life philosophy we call Yes And! TIM is so excited to be hosting the First Annual Tucson Comedy Arts Festival. Check out our festival website for information on what acts are coming to perform, our full show schedule, and of course our top notch comedy workshops taught by nationally known instructors! Next week we will send you our full line up of shows and events! Also available, Dinner and a Show sponsored by CDO Culinary @5:30p. $16.00. Reservations by calling 696.5692. A CHRISTMAS MUSICAL LIKE NO OTHER - TRAILER PARK GIRLS RETURN TO TUCSON - 2 DAY TICKET SALE, ENDS THURSDAY, 10/30! Get your $20 tickets while you can! Seating is limited to 80 - shows are selling out! you can! Cabaret Space - Temple of Music and Art. If you're looking for something a little different in your holiday entertainment this season, RECKLESS just might work for you. Director, Hank Stratton, says of RECKLESS: "The audience should expect a dark, farcical comedy, plenty of twists and turns, and unlikely events—an evening where they themselves are in Rachel’s snow globe, upended by the whims and repeated shakes of Mr. Lucas’ fantastical comedy." TUCSON, AZ - On a snowy Christmas Eve, Rachel discovers her husband has hired a hitman to kill her, sending her out the window and into an unusual series of misadventures that include multiple identities, murder and game shows. Joining forces along the way with a humanitarian and his paraplegic wife, Rachel must reconcile the balance between her inexhaustible optimism and the world’s unavoidable realities. Leaving no Christmas celebration unscathed, playwright Craig Lucas blurs the lines between fantasy and reality in a dark comedy that speaks to love, loss, and the indefatigable hope of the human heart. “Working with the students of ART at the University of Arizona is once again a great pleasure,” said guest director, Hank Stratton. The deep talent in the BFA program is unmistakable, and my task as guest director is to maintain the company’s professional standards, providing the students with a first-rate production to showcase their extraordinary talents.” Stratton added that he is extremely fortunate to be working with brilliant lighting and scenic designers, since without them, he and the cast would not be able to present the professional quality that Tucson audiences have come to expect. Improve your acting skills with Shakespeare Training! Unlocking Shakespeare An ongoing workshop based on the amazing vocal and physical exercises as practiced by the Royal Shakespeare Company. An intense and fun on-your-feet approach to Shakespeare's language. Whether you are a complete beginner or advanced classical actor, this unique neurolinguistic approach will have you speaking the exquisite poetry of the Bard naturally and fluently. Philip G. Bennett, Artistic Director is internationally recognized as a master instructor of the Stanislavsky System of Acting. He holds a BA in Humanities and a Masters in Theatre Arts and Sciences from the renowned American Stanislavsky Theatre in New York, where he served as actor, instructor and Assistant Artistic Director to Sonia Moore, émigré actress/director from the Third Studio of the Moscow Art Theatre. During Mr. Bennett's forty-six years of professional experience as a classical actor and director he founded the San Francisco Theatre Academy, The Stanislavsky Ensemble Repertory Company and the Bennett TheatreLab. He is a recipient of the prestigious Hollywood DramaLogue Award. Graduate students appear regularly in film and television, and are accepted in conservatories and repertory companies in the US and the UK. Phil is co-author of Experiencing Stanislavsky Today: Training and Rehearsal for the Psychophysical Actor, Routledge Academic Publishers, London. Of course you've already seen “The Phantom of the Opera.” Who hasn't? The Harold Prince version of the Andrew Lloyd Webber musical opened in 1986, for cryin' out loud! The performance numbers it has amassed since then are astronomical (literally!). But if you haven't seen the redesign by Cameron Mackintosh of Webber's super-mega-iconic show, you truly haven't had the complete “Phantom” experience. College professors and high school drama teachers will be making insightful observations for years on the differences between the Prince original and this Mackintosh creation now playing through Nov. 1 in Centennial Hall, presented by Broadway in Tucson. For one thing, since 1986 movies and television have reawakened in high definition an army of vampires and other timeless lovers of the night. They have become dashing young men of remarkable sexual demeanor in the not-necessarily-haunted dreams of today's self-reliant girls and young women. These creatures of eternal passion exist in today's real world of hybrid cars and smart phones that border on digital genius. So does this version of “Phantom,” using the same music and the same characters, but looking new with crisp set designs, lighting and rock concert sound enhanced by shooting flames and a chandler that shakes and swings through Act One before it blows out sprays of sparks in its final collapse. 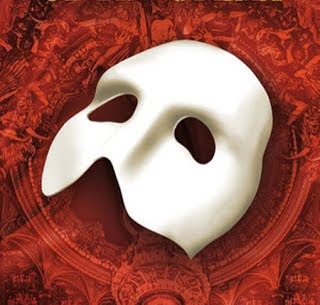 Several current reviews online also note how the Phantom and his love Christine Daae now look younger, leaner and generally more glamorous in a cinematic way. This Phantom would fit right in, comfortably hanging out with that new bunch, for sure. And slender Katie Travis singing the role of Christine has a voice to equal any of today's opera singers. So do the once buffoonish Paris Opera House soloists Carlottta Guidicelli (Jacquelynne Fontaine) and Ubaldo Piangi (Frank Viveros), now delivering their lines with genuine chops. The most spectacular set piece is a stage-to-rafters castle-like tower that turns and also opens in several different ways. The outside castle wall contains a spiraling stairway that descends into darkness and the waiting boat that carries the Phantom and Christine to his lair amid the sewers of Paris. Truly, I did miss the expansive lagoon of mists and mystery in Prince's original. There is little of that in this production. But, because everything now feels more direct, more real (and because we've had all that training with vampires in love), the ending so famously poignant is now even more so. If you think this war horse musical could not possibly drag more emotion out of you than it already has...don't be so sure. "The Phantom of the Opera,” presented by Broadway in Tucson, runs through Nov. 1 at various times in Centennial Hall, 1020 E. University Blvd. The running time is two hours, 45 minutes, with intermission. Tickets are $30-$140. For specific show times, reservations and other information, broadwayintucson.com, or in person at the Centennial Hall box office. Gaslight Theatre: Added shows for Henry Porter! Next week! Last Chance. Subject: Gaslight: Added shows for Henry Porter! Next week! Last Chance. 2 Shows added for Henry Porter! These dates are your last chance! Maude (Susan Kovitz) will try anything to get Lionel (Roberto Guajardo) to say her thrift store find is an original Jackson Pollock. Life is about hope, the magical ingredient that can make anything seem possible. But if that doesn't work, life can also be about getting down and dirty. Survival, after all, is the bottom line. That's the underlying message of “Bakersfield Mist” by Stephen Sachs, directed by Gail Fitzhugh, now playing at Invisible Theatre. This two-hander with Susan Kovitz and Roberto Guajardo pits intuitive intelligence against learned arrogance. At the center is a painting by modern art's splatter master, Jackson Pollock, whose abstract paintings can closely resemble a house painter's drop cloth and have inspired may ingenious descriptions. Kovitz plays Maude. She has lived in rough-around-the-edges trailer parks her whole adult life. One day as a joke on a friend, she went to a second-hand shop and bought the ugliest picture she ever saw. Cost her $3. Up to that point, Maude didn't know Jackson Pollock from Irving Peacock. But she know the internet and pretty soon she knew all about Jackson Pollock. And with each new fact, she became more convinced her painting was a genuine Jackson Pollock, too. Hey, it could happen. Who among us hasn't wandered through a Good Will store and felt sure it must contain some lost treasures. Maude is so convinced, she convinces a world class art critic to verify the painting's authenticity by visiting her trailer – modest on the outside but filled with every kind of forgotten tchotchke from the past 75 years of pop culture. Remember those Bum Steer bars from the 1970s? Like that. Which is exactly where “Bakersfield Mist” begins. A somewhat effete Lionel (Guajardo), conspicuously dressed in a suit and tie, looks and feels misplaced as an outer space alien when he knocks on Maude's door and dogs start barking. But Maude looks at him and sees a meal ticket. All Lionel has to do is say her painting is a Jackson Pollock, and she is set for life. It doesn't matter (to Maude) if it is actually a Jackson Pollock or not. That only matters to Lionel. His meal ticket is his spotless reputation. The heart of “Bakersfield Mist” is watching Maude dance around Lionel's sophisticated mannerisms, sizing him up. Not worried that she can't match his superior intellect because she knows under his over-stuffed shirt there beats a heart just like all the other guys she has ever known. Lionel, at the same time, knows his survival and escape from the clutches of these trailer people depends on keeping the upper hand. Kovitz and Guarjardo are two of Tucson's most respected stage talents. They fill these characters with the kind of intensity that knows how to survive. Please note, too, that some of the language gets rather rough. There is no lack for the F-word. “Bakersfield Mist” continues through Sunday, Oct. 25, at 7:30 p.m. Wednesdays through Saturdays, 3 p.m. Sundays. Plus an additional 3 p.m. performance Saturday, Oct. 24, at Invisible Theatre, 1400 N. First Ave.
Congratulations to the "Best of Tucson 2015"
"WHODUNIT" SPECIAL THURSDAY 10/22 AT 7PM! TPAC x 10West | Arts panel discussion! WHO'S BEHIND "GOD'S MAN IN TEXAS"
TIM's Funny on Fourth: Open Doors 4 Ghosts! TPAC Now accepting GOS Grant applications! Introducing PACZ & the New ZUZI!